The K-Style Hub is an extremely useful attraction that may be unknown to many international tourists! This one-stop complex has information to meet all tourists' needs, from a tourist information center to various experience zones, exhibition halls and even sales of local specialty products! 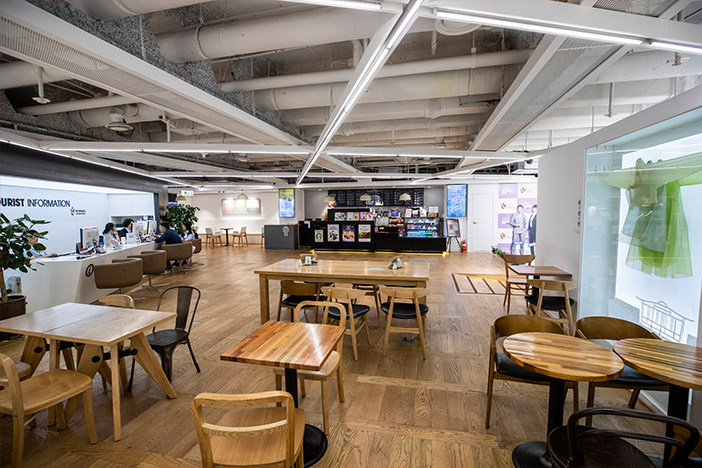 The hub is spread out over four levels, with the Tourist Information Center found on the second floor, Korean Culinary Culture Exhibition Hall and Korean Cuisine Culture Center on the third and fourth floors respectively, and the Regional Tourism Experience Hall on the fifth floor. Although each floor has its own range of fun experiences to enjoy, there are eight experiences that you cannot miss! 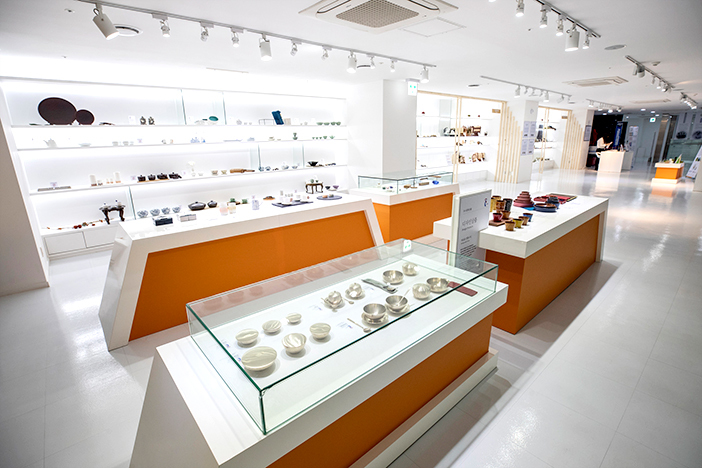 Following our guide, you will lose yourself in the hidden charms of K-Style Hub! The Tourist Information Center (TIC) found on the second floor offers a wide range of useful travel information and services to tourists visiting Korea; it also serves as a great resting place for travelers who need a short break while sightseeing around the city. Visitors can ease their travel fatigue while reading up on Korea tourism through the broad selection of tour-related brochures, guide books and maps provided. In addition to travel brochures and maps on Seoul’s attractions, travel information on attractions and festivals in other regions is also widely available. If you have trouble finding what you need, the staff at the tourist information desk are ready to attend to all travel inquiries. TIP) Need help with accommodations or transportation? If you need help purchasing train tickets or making reservations for accommodations, simply head to the Travel Service desk. Professional travel agents are available to provide consultation and help in reserving train tickets, flight tickets, accommodations and processing payments on-site. In addition, the sale of transportation cards exclusively for international visitors, Wi-Fi eggs (portable Wi-Fi), and even SIM cards are offered here. 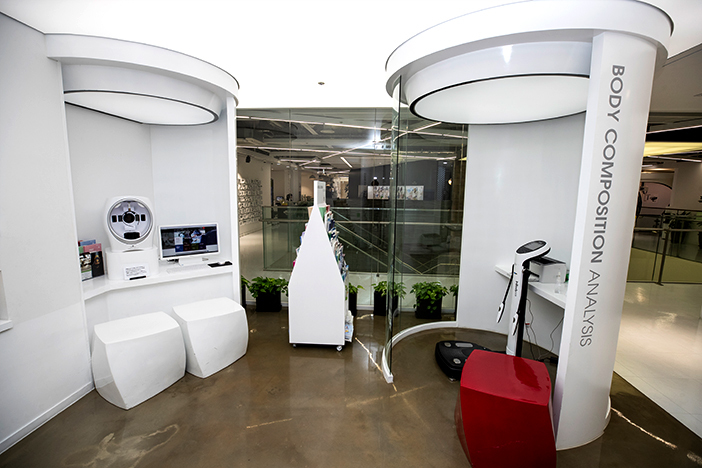 Instead of reading a typical brochure or guidebook, visitors can experience about 40 major tourist attractions around the nation through the 360-degree panorama gallery. The views are so real it will feel like you’re there in person! 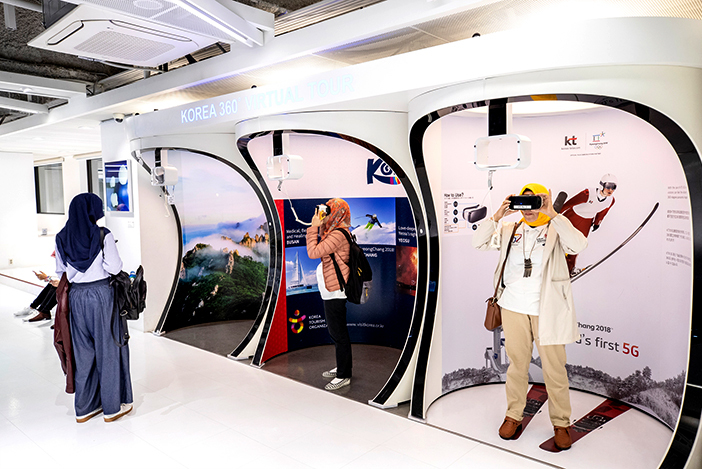 In addition to the panorama gallery, visitors can also enjoy the feeling of walking around popular sites like Gyeongbokgung Palace and Myeong-dong or even experience ski jumping in Pyeongchang through the VR Experience Zone. For K-pop fans, the Hallyu Experience Zone is a section that you definitely should not miss! Visitors can take photos with top K-pop stars through advanced technology and at the photo zone. There are three types of photo-taking experiences available; ring the bell to visit the idol’s house, imitate top idols’ trademark gestures, or show your love for your favorite star. Take a variety of concept photos for the full experience. Photos taken with stars at the experience zone only stay on screen for about 3-4 seconds before being erased. So, it is recommended to take pictures with your own camera for photo keepsake purposes. There are countless activities that international tourists may find at the K-Style Hub, including the Medical Tourism Information Center. Although the center may not seem that exciting at first glance, there are in fact four experience programs hidden here. The programs range from tests that find the most suitable medicinal tea for you, to a facial analysis and overall body check-up and even an assessment of your stress level. These programs are open to all with no reservations required. Take this chance to learn more about your body and health! Visitors to the Medical Tourism Information Center can take part in making a scented medicinal pouch, one of the center’s permanent experience programs. Visitors can choose medicinal herbs to create their very own herb pouch as a souvenir. 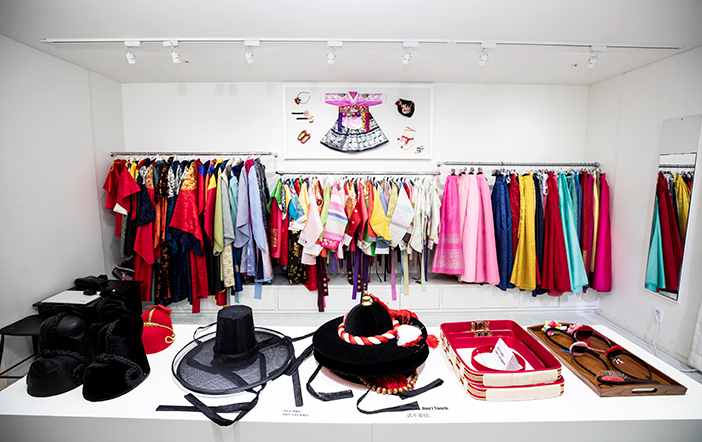 One of the most highly sought-after activities among international visitors to Korea is none other than trying on hanbok! 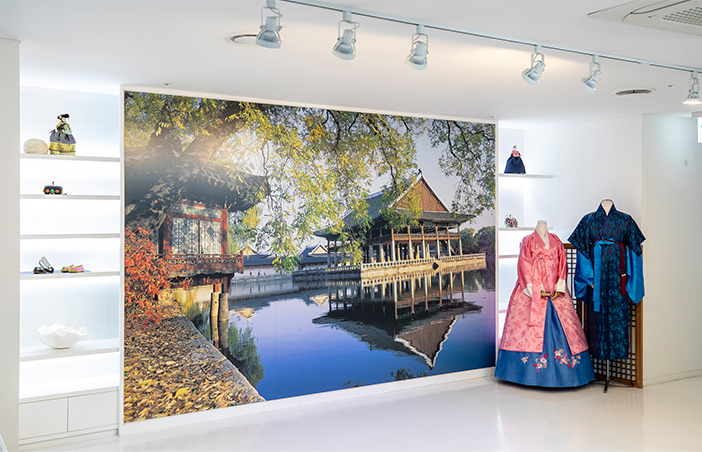 Currently, a free hanbok experience is available on the fifth floor of the K-Style Hub. Whether it is traditional hanbok like those worn by royalty, or the recent trendy fusion-style hanbok, a diverse selection of designs is available for you to choose from. Unfortunately, the hanbok here are not permitted outside the center, but the photo zone is perfect for backdrops! Each hanbok is available for thirty minutes, unless visiting after 17:40, at which point the rental time is limited to fifteen minutes. The experience is available on a first-come, first-served basis for up to six people per session. Groups of ten to 24 people can call (+82-2-729-9433 / English, Chinese) to make a reservation in advance. Please note that there is only space for one group visit per day, and reservations are not accepted on weekends or public holidays. The entrance to the Korean Culinary Culture Exhibition Hall on the third floor has an eye-catching design. 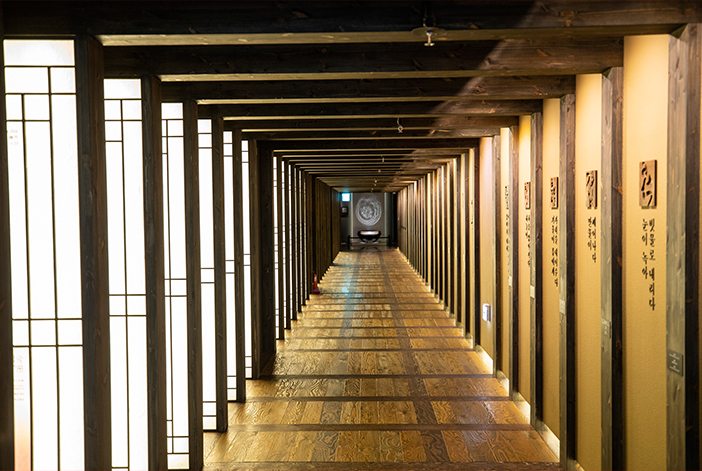 The long hallway is decorated with an authentic traditional Korean atmosphere. A total of 24 traditional lattice screens can be found, each exhibiting a section on Korea’s seasonal food. 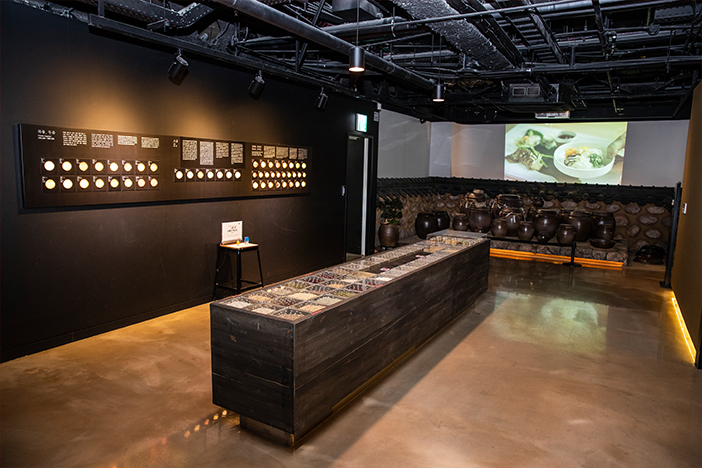 Beyond the entrance, visitors can find a variety of Korean grains and seasonings, as well as a performance of video projections displaying on the top of various onggi (Korean pottery). The famous Korean folk song “Arirang” can be heard playing in the background. This performance was an exhibition held at the Milano EXPO in Italy and was given high praises for displaying the beauty of Korea’s traditional music and food. The Korean Culinary Culture Exhibition Hall offers foreign language services (English, Japanese, Chinese) for international visitors. The service is available at all times upon request on-site. After learning about Korean culinary culture on the third floor, visitors can cook their very own Korean food on the fourth floor. The Korean Cuisine Culture Center is divided into three sections. 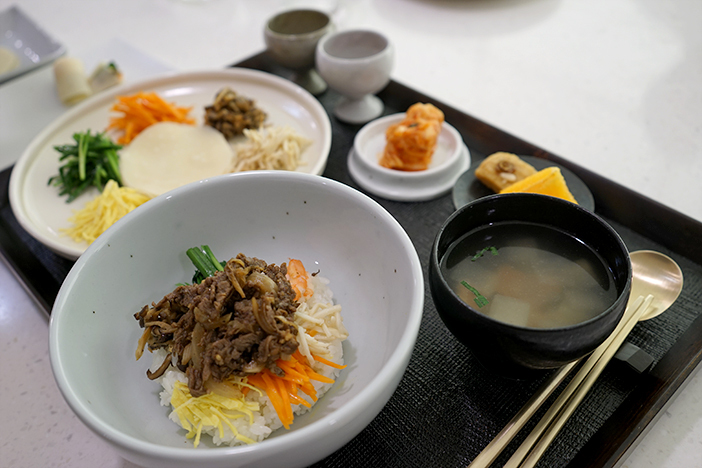 You can make a wide assortment of Korean foods at the Learning Space, enjoy a taste of representative Korean foods at the Festive Corner, or obtain valuable Korean recipes at the Korean Food Sarangbang. Please kindly note that separate program fees apply to the first two sections. The Learning Space operates regularly, with cooking lessons varying according to the time and day of the week. For those who are interested, reservations via phone have to be made at least three days prior to the visit, and lessons may be cancelled if there are less than six people signed up for the program. The last stop at the K-Style Hub is the Promotional Exhibit Zone, located within the Regional Tourism Experience Hall on the fifth floor. This large space has representative items from around the country gathered in one place. Visiting the exhibit will allow one to see outstanding products made by Korean designers and artists, as well as get a better understanding of the meaning and ideas behind the works. The Regional Tourism Experience Zone, located next to the Promotional Exhibit Zone, is an exciting way to experience major attractions throughout the country. ☞ Main programs: Provide tourism information, tourism product sales, experience programs (hallyu, virtual reality, hanbok, traditional craft, Korean cuisine), etc. * This column was last updated in April 2019, and therefore information may differ from what is presented here. We advise you to check details before visiting.